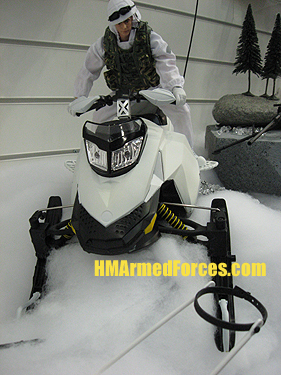 Arctic Mission includes detailed snow-equipped figures and vehicles and is the new HMAF range for 2010. Other vehicles in the Arctic Mission range include the Tactical Battle Tank and Quad Bike. Though the Remote Controlled Military Skidoo is without doubt the must-have toy from the range. The skidoo is purpose-built for Arctic Missions, often used in the field for special reconnaissance or by officers to move quickly between sections. The HMAF RC Skidoo is liveried in white and black on the undercarriage with some yellow detailing on the suspension springs and fairing. The finely detailed HM Armed Forces Military Skidoo features real working headlights and is perfectly scaled for the HMAF figures to ride on.